Christmas time can be very stressful! Not only does life seem to be more chaotic this time of year, but there are gifts to be bought and that alone causes panic. What do you get for someone who has everything? What if they don’t like what you give them? Are you just wasting your money? In the spirit of giving, we thought we would help make everyone’s shopping a little easier by giving you our lists of great gift ideas (suited for every budget!) for that DIYer in your life. Most are practical, some are a must, and others may be as much a gift to the giver as to the receiver. It's not uncommon for people to start a wood staining project only to discover--very quickly--that the wood they're staining doesn't seem to take the stain the way they had expected. And when that happens, things get frustrating quickly! On this segment, we talk about some common woods and their limitations when it comes to accepting stain. We also dig into some of the concessions we as homeowners have to make when tackling a staining project. After all, wood is a natural substrate and as such, it's full of "character"! And that means the pieces aren't going to be exact duplicates. There will be variations. Accepting it right at the beginning will help. On top of EVERYTHING we said in the segment, if you have the opportunity, before you have custom cabinets, built-ins or even trim installed, talk to the finisher. The builder you hire can direct you to the finisher he or she uses. And once you can actually sit down with that person, take time to discuss the color you want to achieve with your stain and listen to the recommendations regarding wood choices! Finishers are always in the position on a job to take whatever wood was used and make it beautiful. And sometimes, this is a monumental task. They definitely know what woods are going to produce the best results and can make some solid recommendations for you based on the color you want to achieve. Take that info to your builder and see if you can have the items built in that wood so you end up with the color results you want. If you don't have a finisher or are doing the work yourself, make sure you stop at any RepcoLite or Port City Paints Store, and bring your target color and we will gladly make a wood recommendation! Some of us procrastinate when it comes to buying a snowblower. We really just want to see snow on the ground and KNOW it's going to stay before we shell out the cash. Or, sometimes we find ourselves in the market because after the first real snowfall happens, we start our old one up only to realize that last year was it's last year! Whatever your situation, if you're in the market for a snowblower, we've got answers! We're on the phone with Larry Bergman from Bergman Power Equipment and he's got some solid recommendations to help you make sure you pick up the right machine for your situation! 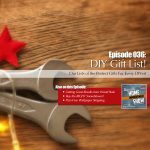 Looking for a great list of home improvement tools for that DIYer on your Christmas list? We've got the best recommendations out there. My first choice is a good tape measure. Yes, it's boring. No, it's not flashy. But it is practical. The tape measure I like is called the TRUST 72-7525 Tape Measure. You can pick it up for around $12 (so I'm stretching the price limits a little), but it's worth it! My first choice is cooler than Dan's: it's a bucket organizer. Simply put it in a 5-gallon bucket and you've instantly got a very portable tool box! It has pockets and looks for all your tools and you can put larger items in the bucket. It also works great for all your painting supplies. A stud finder. Stop pounding the walls and hoping to hear a different sound. And even more so, stop pounding nails in the walls in little trial and error sections! I've done both and definitely have enjoyed the ease of use and accuracy of a stud finder. No, they're not perfect. Yes, they can make mistakes from time to time. But overall, it's a time saver and a wall saver! A multi-tool. I love these things! And while you could go crazy and buy a very expensive one, even a $25 multi-tool will get you at least a knife, a pliers, a wire cutters, and flat head and Phillips head screwdrivers! Everything you need to use in a pinch! An orbital sander. You'll use it all the time and on all kinds of different projects. I've used it to sand everything from furniture, to boards, to the edges of a deck where a bigger floor unit wouldn't reach. It is remarkably handy. And best of all, you can get a good one for under $50. Vampliers Screw Extraction Pliers! These these are AWESOME! I did everything I could on-air to describe them, but a picture's worth 1000 words. The rows of teeth are designed to grab even the slipperiest screw and help you extract it with ease! Just read the reviews on this tool! It's definitely something for every toolbox. And, best of all, it prices out at about $40. So you've got $10 you can spend on that bucket organizer! A jigsaw. And a good one. Don't skimp! Get one that has variable speeds and an easy mechanism for changing blades. This is another of those tools that is a workhorse around the home. No, it's not as fancy as Betsy's Vampliers, but you're going to use it way more! (Unless you routinely strip screws!) The biggest point to stress here is to invest in a good saw. Read reviews, ask questions and find one that will do what you need. A laser measure. Specifically, I'm recommending the Bosch GLM 40 Laser Measure. It'll measure area, length, volume and will also do addition and subtraction! It's pocket sized and is perfect for anyone who has the need to measure larger areas, like rooms, on a regular basis. If you can spend the money on someone you love dearly, you can't go wrong with this drill/driver and impact driver combo set! As we mentioned in the show, an impact driver is an amazing tool if you drive a lot of screws. It's better than any other tool at the job and makes easy work of drilling screws into even the thickest, most dense boards. Man Crates. Yes. You read that correctly. As Dan said, they're basically funny and cool crafty kits for guys. There are knife making kits, pipe carving kits, a chef kit (complete with band-aids). And best of all, many of them come in super cute (ahem, I mean ultra-manly) wooden crates. With a tiny pry bar. Which is actually half the fun! Give the gift and then laugh til you cry as your loved one tries to open it! It's awesome. Unique. And definitely makes me the winner of this contest! Check them out! When you hear the words "wallpaper stripping," do you cringe? When you see dated wallpaper in a potential new home that will have to be stripped, do you make a beeline for the door and cross the house off your list? These seem to be common reactions when people even THINK of stripping wallpaper. And this can happen for a couple of different reasons. People have stripped wallpaper before and had a terrible experience. People have heard horror stories of stripping wallpaper and don't want any part of it. Our goal with this segment is to give you all the information you need to make wallpaper stripping painless and to ensure success. Betsy is of the opinion that it can even be (gasp!) fun and oddly satisfying as the paper comes off in large sheets. The secret to stripping wallpaper is PATIENCE and KEEPING THE PAPER WET! These two things will put you on the path to wallpaper stripping glory!